The farmer’s dog had been very useful to him, but the dog was getting old. The farmer decided to drown him. 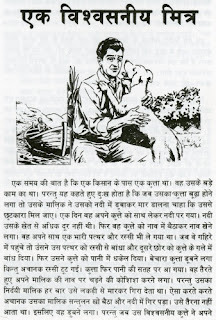 Taking the dog with him to a large river near his farm, the farmer got into a boat and rowed out to the deepest part. He tied a rope around the dog’s neck and attached the other end to a heavy stone. Then he threw both into the water. The poor dog sank, but the rope broke. The dog rose to the surface and, with a whine, tried to get back into the boat. Unswayed, his master repeatedly shoved back the scrambling dog. Finally, the farmer stood up in the boat, intending to beat his dog hard enough with the oar to send him to the bottom. Losing his balance, the farmer splashed into the water. The man couldn’t swim, and he was too far away to reach the boat. The dog saw his master drowning, and, in spite of the cruel treatment he had just received from him, the dog swam over, caught hold of his clothes, and brought his master safely to shore. How cruel and heartless the farmer was to his faithful dog! We may even feel the man deserved to drown. We hope he had a change of heart and repaid his faithful friend by taking good care of the dog for the rest of his days. Let’s turn this picture around. Aren’t you and I, and everyone else, far more guilty than this farmer in our treatment of the kindness and love of God’s Son, the Lord Jesus Christ? Jesus came into this world and spent His life doing good, healing the sick, giving sight to the blind, raising the dead, feeding the hungry, and bringing joy and relief to the sad and weary. But how was He treated in return? Men cried, “Away with Him” (John 19:15), and nailed Him to a cross to die! How evil and cruel men were to put to death Jesus, the Son of God—the one perfect, sinless man sent in love from God. Putting Him to death exposed the hatred and hostility of man’s heart against God. Who Has a Sinful Heart? Were those men who put Christ to death the only ones who have sinful hearts? Certainly not! You and I have sinful hearts just like those who cried, “Away with Him,” for God says, “The heart is deceitful above all things, and desperately wicked: who can know it?” (Jeremiah 17:9). Just like those men, we’ll take His blessings one moment but want to get rid of Him the next if what He says doesn’t agree with what we want. Take a close look at that blessed Son of God on the cross. He doesn’t resist the cruelty inflicted upon Him. He doesn’t say one word in anger or show resentment. The prophet Isaiah declares, “He is brought as a lamb to the slaughter, and as a sheep before her shearers is [silent]” (Isaiah 53:7). Instead, when everything is against Him, His love flows out to a world of guilty sinners. He prays, “Father, forgive them; for they know not what they do” (Luke 23:34). The cross is the place where men tried to get rid of Him. Instead, His death and resurrection become the means by which His saving power flows out to all who come in repentance, admitting they are sinners, and receive Him as their Saviour and Lord. 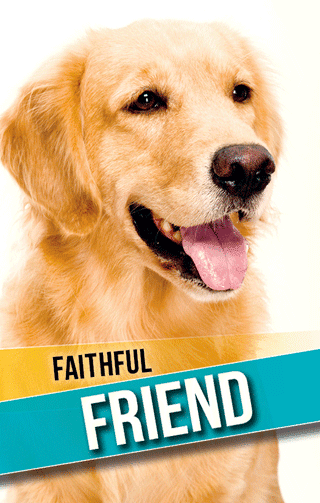 The faithful dog saved his ungrateful master’s life, but Jesus saves not for time only but for eternity. He gives eternal life to whosoever will believe! If you have not placed your faith in this blessed Saviour, receive Him now before it is too late. Soon He will come in judgment on this world, when His anger “shall burn as an oven” (Malachi 4:1). Then He will be your judge! “In this was manifested the love of God toward us, because that God sent His only begotten Son into the world, that we might live through Him. Herein is love, not that we loved God, but that He loved us, and sent His Son to be the propitiation for our sins” (1 John 4:9-10). To purchase: No minimum quantities on any tract purchase so single copies or whatever is required may be ordered. Pack quantities are given for those who want to purchase a complete pack.